If you are searching for simply the best high end coffee maker than you will be more than satisfied with the Technivorm Moccamaster KGB-741. It is beautifull to look at, has the highest build quality and makes for a perfect cup of coffee. It is a bit pricey, but well worth the cost. The BUNN BT Velocity may not have the most features or be really good looking, but it makes it up with speed and convenience. Easily the fastest coffee maker in this lis, it also comes with a heat storing thermal carafe to take your freshly brewed coffee on the go right away. The Bonavita BV1900TS allows for a perfect hot cup of coffee and is the only machine that comes with pre-infusion, used to degas the beans before brewing. High powered and light weight, this small device has some handy features for real hands off coffee making for a modest price. Whether you’re into delicious, flavored pre-ground coffee or high-end, specialty coffee beans, high end coffee makers make all the difference in getting the perfect brew. There are a lot of questions that may jumble around in your head as you try to make a decision on which high end coffee maker you want to purchase. These questions could include, but are not limited to: How many cups will it make per ounce? Does it have an included coffee grinder? Is the pot metal or glass? Does it work through drip, percolation, siphon or french press? Can it make single cups or will it only produce large pots of coffee? Can it brew espresso as well? Any question you may ask about what features may exist in a new coffee maker are all legitimate. And while you can certainly return a coffee maker after buying it, you’re going to want to make a solid purchase the first time around that you know you’re going to be happy with. Here, we’ve looked into some of the best high end coffee makers currently available. You’ll find our list is whittled down to just the top 5 high end coffee makers, helping to not only save you time, but make your decision quickly, easily and confidently. In this article you will find the full list of the best high end coffee maker for 2016. The Moccamaster KBG is the best high end coffee maker on our list for many reasons. The first, and admittedly most superficial reason, is because of how gorgeous this machine is. Technivorm, a Dutch company, has been handcrafting coffee makers for half a century. The Moccamaster KBG 741 (read full review) is a beautiful, handcrafted machine, with polished silver highlighting the machine’s fine qualities and the expertise of the craft. 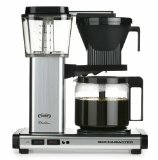 Functionally, this is the best high end coffee maker because of the excellent cup of coffee it will produce. The machine is both energy efficient and quick. As a drip coffee maker, it can utilize a reusable, cleanable filter, cutting down on the excess costs that come with paper filters. The auto-drip stop also ensures that when you’re ready to remove the carafe, you won’t have a messy cleanup on your hands. It can produce a maximum of 10 cups of coffee, all of which drip into the high quality, 10-cup glass carafe. The device takes only 4-6 minutes to brew a full carafe at an even 196-205 degrees, and will continue to heat the coffee evenly for 100 minutes before the auto-shut off engages. Your coffee will keep at a toasty 176-185 degrees for an hour and a half, great for those long mornings when you’re ready to reach for a second cup before heading out for the day. 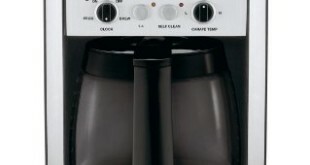 The carafe includes a destratification tube that helps to ensure an equalized temperature from top to bottom. The Moccamaster KBG slims down on some of the excess features you may find in other coffee makers, but its handcrafted appeal and excellent drip features makes it the best high end coffee maker on our list. The BUNN BT Velocity Brew is all about speed. It’s in the name. The BUNN BT Velocity Brew is a compact device, weighing in at a comparatively light 9.2 lbs. BUNN BT strips away many of the features found in other drip brewers, focusing only the brew speed: an impressive 3 minutes for a full 10 cups. What you won’t find on this drip coffee maker are any frills. There is no heating pad to keep the already-brewed coffee warm, although the Velocity Brew comes with a heat-storing thermal carafe. The carafe is also vacuum sealed, and can be locked for transportation, allowing you to take your full 10 cups on the road. A reusable mesh filter can be used with the Velocity Brew, helping to cut down on usage costs as well. Although the BUNN BT Velocity Brew is light on features, it’s big on speed and portability, something many other brewers cannot claim. The Bonavita BV1900TS 8-Cup Carafe Coffee Brewer Stainless Steel is a very lightweight, high powered device. While Bonavita advertises that the device only holds 8 cups as opposed to the more common 10, many users have found that Bonavita considers 5 ounces to a cup, whereas other makers consider 4 ounces to a cup. This means the Bonavita device will still brew the same overall 40 ounces. It has a very powerful 1500 watt heating element, allowing for a hot and (and optimal) 195-205 degree brewing temperature. 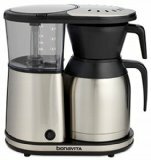 Unlike many other brewers, the Bonavita BV1900TS 8-Cup Carafe Coffee Brewer Stainless Steel (read full review) has an optional pre-infusion mode, allowing you to pre-wet your ground coffee, aiding in degassing the beans. The device has a one-touch brew operation and auto-shut off. Once your coffee is done, the device automatically shuts off, with your hot coffee waiting for enjoyment in the stainless steel carafe. Every drip coffee maker uses a “showerhead” to pour water over the ground coffee. 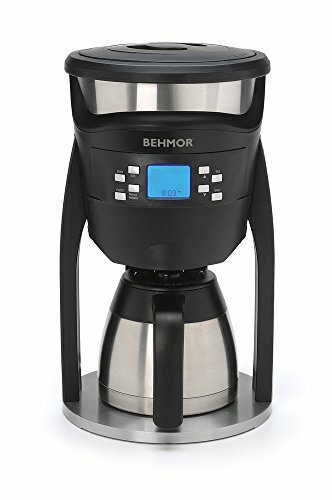 The Behmor Brazen Plus coffee maker uses a 3 inch diameter shower head for a very even application of water, and a pulsed water release to help ensure a steadier flow. The result is a tasty cup for coffee. The Behmor Brazen Plus looks like a rocket ship ready to take flight, which isn’t too far off, considering it’s providing a hot, steaming cup of coffee. Stainless steel construction can be found in both the 40 ounce thermal carafe and the heated water reservoir. A pre-soak feature allows for a better quality cup, giving the ground beans time to bloom. Unlike the other drip coffee makers on our list, this machine is fully programmable. You can set the brew temperature (between 190 and 210 degrees Fahrenheit), and set your device to brew at a specific time of the day. The Behmor Brazen Plus (read full review) is a great addition for coffee lovers on the go. 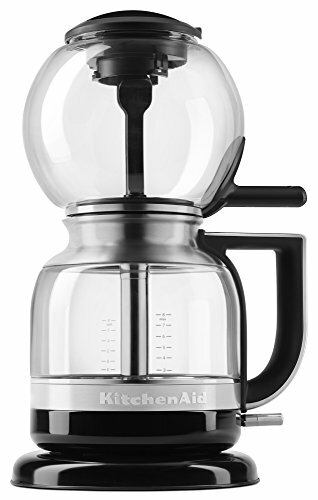 The KitchenAid KCM0812OB Siphon Coffee Brewer wins no awards for speed. In fact, this unique little brewer can take upwards of 10 minutes to brew a full 8 cups of coffee. However, the beauty in this device is its bucking the trend toward drip coffee, instead reverting back to dying science of siphon coffee brewing. This brewer works through vacuum and air pressure. The heated water is siphoned up to the top of the brewer, where it is then mixed and bubbled with the coffee grounds. The grounds are fully immersed in water, and the coffee is then siphoned (and filtered) back into the carafe. The device shuts off automatically once everything is complete. Siphon coffee makers produce a very vibrant, clean brew, offering a taste experience that everyone should try. The very lightweight device has two key pieces: the round brew unit at the top, and the carafe. These two pieces lock together magnetically for a secure fit. Once your brew is done, you remove the brew unit, and you’re ready for an excellent coffee experience. High end coffee makers can sometimes be a tough sell. Often, they shirk some of the common features found in lower-end coffee makers, while adding in features that you may not realize make all the difference. However, a high end coffee maker will make a cup of coffee in a much cleaner, more efficient way, allowing for cups of coffee with a more vibrant flavor than what you may be used to with lower end and cheaper coffee makers. It’s impossible to tell the difference, of course, until you actually try a cup of coffee made using a high end coffee maker. That leaves everything down to which option is best for you, and which one you think may be the best high end coffee maker for your taste and money. On our list, we include 4 high end coffee makers that utilize drip technology in different ways, and one high end coffee maker that attempts to resurrect an older form of coffee brewing. Each has various features that you may find attractive, but ultimately you’ll only choose the one that best suits your time and needs. We chose the Moccamaster KBG 741 10-Cup Coffee Brewer as our top coffee maker because of its features. This device is slightly above $300, making it the most expensive on the list, but it also has all of the key features you’re likely to look for in high end coffee makers. The polished silver is highly attractive as a show piece, but it also helps prevent rust. Likewise, the high water reservoir makes for easy viewing regarding water level. The shower head on this device uses a pulsing action, ensuring that water is dripped in at an even rate, preventing the coffee from dripping too quickly, and allowing time for the coffee to properly bloom in the filter before it drips into the carafe. The importance of the destratification tube in the carafe can also be easily overlooked, but one of the biggest concerns with coffee is an even, hot temperature. In many devices, the heating ends as soon as the brew is made. This is true of most brewers that use thermal carafes. However, the Moccamaster KBG 741 10-Cup Coffee Brewer uses a glass carafe that stays heated for nearly two hours after the brew is done. The destratification tube helps to equalize water temperature, so you won’t have to worry about pouring from the top and getting cold coffee, while the hotter coffee sits at the bottom. 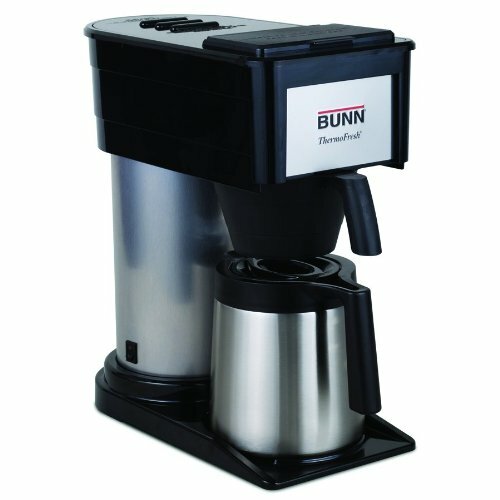 Of course, if you’re into speed, you will naturally gravitate toward the BUNN BT Velocity Brewer, which is unequivocally the top coffee maker on our list for brewing time. The ability to brew in 3 minutes and be out the door with your thermal carafe is an extremely appealing offer. On a similar note, the thermal carafes on the Bonavita BV1900TS 8-Cup Carafe Coffee Brewer Stainless Steel and the Behmor Brazen Plus each offer long-lasting temperature retention, with some portability. The most interesting on our list, of course, is the KitchenAid KCM0812OB Siphon Coffee Brewer, which operates on a wholly different brewing principle than the drip brewers on our list. Siphon brewers offer a unique visual experience as well as a different flavor experience, making the KitchenAid device highly desirable for those who want a high end coffee maker that also looks and operates like a unique device. While the MoccaMaster KBG might be our pick for the best high end coffee maker, you may find yourself attracted to the different devices on our list as well. Previous Technivorm vs. Bonavita: Who’s the Winner? Next What is the Best Coffee Maker Under $100?